Preparations are on to permanently base a squadron of 17 aircrafts to enhance the security of India’s energy-rich eastern seaboard. The Indian Navy is planning to deploy MiG-29K and MiG-29KUB fighters to protect the east coast of the country, DefenceWorld.Net said on Tuesday. The website cited media reports as saying that preparations are on to permanently base a squadron of 17 aircrafts to enhance the security of India’s energy-rich eastern seaboard. The MiG-29Ks will be based on the INS Vikrant aircraft carrier, for which work is going on at the Cochin Shipyard, according to the website. 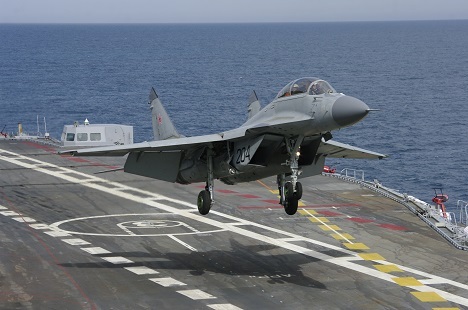 Russia will deliver the second squadron of aircraft meant for the indigenous aircraft carrier by 2015, DefenceWorld added. Last year, the Indian Navy commissioned its first squadron of MiG-29K/KUB shipborne fighters, dubbed the ‘Black Panthers.’ The squadron comprised of 12 single-seat MiG-29Ks and four two-seat MiG-29KUBs, which Russia supplied under the 2004 contract with the Indian Defence Ministry. The MiG-29K is a naval variant of the MiG-29 land-based fighter, and has folding wings, an arrester tail-hook, strengthened airframe and multirole capability. It can be armed with a wide variety of air-to-air and air-to-surface weaponry. India is modernising its Soviet fighters under the MiG-29UPG programme to bring all the fighters up to the capability level of the MiG-29K and the MiG-29KUB.